Apple thief Horse love the flavour of apples, especially apple cider vinegar. Our biggest success story has been the development of pure Apple Cider Vinegar (ACV) tinctures made using traditional methods that go back centuries. No other company in the UK made pure ACV tinctures for horses without alcohol or honey added. We were repeatedly advised to simply make 1:3 grain alcohol extracts at 60% to 90% proof, as is the pharmaceutical standard. These extracts being double the strength of your straight spirits such as whisky, vodka or brandy. The extracts being the result of prolonged heating and evaporation of the water content, then reconstituting the concoction with strong alcohol 60% to 90% strength to their required volume. The pharmaceutical industry has grown used to making these over strength alcohol extracts and calling them "tinctures". Traditional herbalists have always made tinctures using cold maceration and percolation methods to capture all the medicinal properties, loosing nothing to evaporation. The detrimental effects on the liver and metabolism caused by these high strength concoctions of 60% to 90% alcohol, was of great concern to us. There had to be a better way to make our tinctures for horses. Over proof alcohol extracts for horses was not an option considering the adverse effects on the liver and internal organs. Incredibly, one company making these extracts for horses, boasted about their high strength extracts, whilst dissing vinegar tinctures and honey referring to them as fillers! The medieval German herbalist Hildegard of Bingen prescribed raw apples as a tonic and cooked apples as the first treatment for any sickness. Apples have been used medicinally since Ayurvedic physicians first prescribed them to relieve diarrhea. Apple sauce is still a diarrhea treatment today, the pectins being the active ingredient to cleanse a deranged gut. 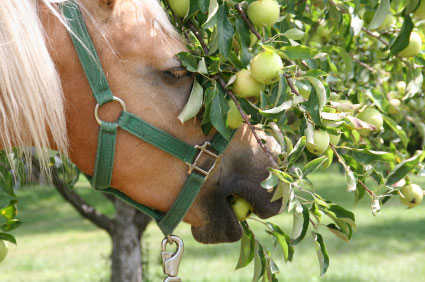 Giving raw dessert apples to horses, cleanses the linings of their gut. Vinegar has been used as a preservative and medicine for centuries. The healing properties of vinegar are extolled in records of the Babylonians. Hippocrates is known to have used vinegar tinctures. Ancient Greek doctors poured vinegar into wounds and over dressings as a disinfectant, and gave concoctions of honey and vinegar to patients. Throughout the ages, vinegar tinctures were used as medicine right up to the 20th century. The Electic (American) physicians such as King and Felter used vinegar tinctures, preferring vinegar to make Lobelia tincture, because vinegar is more efficient when extracting alkaloids than alcohol. During the American Civil War and World War 1, military medics used vinegar to treat wounds. The most famous vinegar story is one of four thieves living in Marseilles (Southern France) during the bubonic plague of 1628- 1631. They robbed the bodies of plague victims yet never succumbed to bubonic plague. The authorities were aware of their existence and decided to let nature take its course. Much to their amazement the four thieves thrived, remaining immune to infection. Desperate to control the plague, the authorities decided to arrest them and discover their secret. The thieves bargained their secret recipe of herbs, garlic and vinegar for a concession to be hanged rather than be burnt at the stake. The recipe was devised by the mother of one of the thieves. The cure for plague, came from a humble herbalist and midwife using her herbal knowledge! No time was wasted. The recipe was printed on large posters then hung on the walls of Marseilles, for all to use. The museum of Old Marseilles still has a copy of this famous poster on display. The plague soon came under control, thanks to the humble recipe of a herbalist ! Dr Jarvis MD, a country doctor in Vermont, noted the amazing good health of farm animals in his district. This good health on investigation seemed to be due to the tradition of Vermont farmers, to give a daily ration of Apple Cider Vinegar to their animals. Maurice Hanssen in his book "Hanssen's Complete Book of Cider Vinegar" has reprinted reports from British dairy farmers published in various farming magazines, during the 1960's. These reports all attest to the amazing results of giving Apple Cider Vinegar to cows. After regular feeding of ACV their cows needed fewer antibiotics and veterinary treatments.